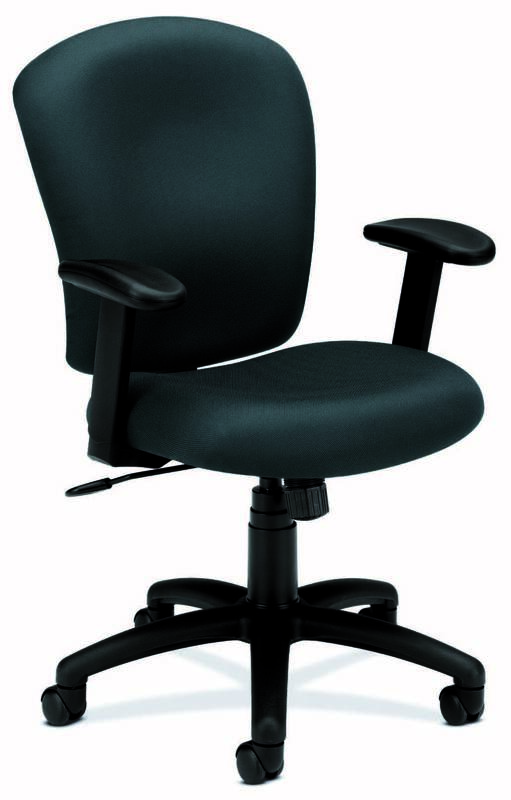 Enter to win a comfortable Hon mid-back chair, a $245 value, Model BASYXVL220. The contoured seat and back provide extra support for long lasting comfort, and the adjustable height arms accommodate many different sized users. Our thanks to www.stockbuggy.com, your e-retail supplier with thousands of products for your home or office. 1. Pneumatic lift. Raises and lowers chair to achieve best relationship to work surface. Proper seat height reduces pressure on legs and improves circulation. 2. 3600 swivel. Swivels over the base, allowing user to remain seated while retrieving items from the active work zone. 3. Tilt. Adjusts seat and back to a reclined position for all-day comfort. Pivot point located above center of chair base. 4. Tilt tension. Adjusts the amount of resistance when reclining to accommodate individual weight and work styles. 5. Tilt lock. Locks the chair in an upright position for constant back support when not reclining. 6. Adjustable height arms. Raises and lowers arms, reducing shoulder, neck and back strain. Win a HON mid-back chair. Last date for entries is December 19, 2010.